Did you know that Cornwall has an Eco-Garden? 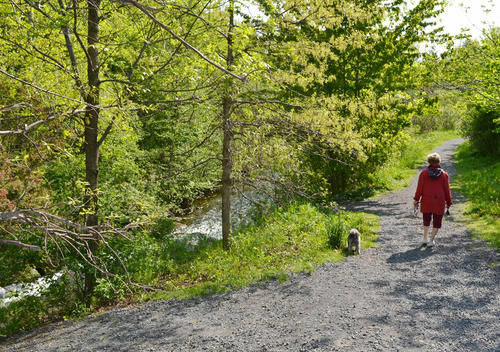 It can be found in the middle of Lamoureux Park and includes a small creek. It was built in 1997 and attracts many fish, birds and amphibians. The creek is key for spawning chinook salmon and the alternating shallow riffle areas and deeper pools have provided a home for cutlip minnow (which requires clear, silt-free streams to thrive). The article goes on to say that smaller streams and creeks have improved in gaining back nutrients for the larger river, but more work still needs to be done. Rock reefs have been built along the river to create protected areas for fish to forage and nurse. The article also lists three areas where work is still continuing on the remedial action plan: contaminant levels in fish, decreases in levels of nutrients in smaller rivers and creeks, and fish and wildlife habitat, in particular coastal wetlands. More info here: Cornwall Standard-Freeholder Image from Standard Freeholder.